Bionic ain't nothing wrong with that how did you do th pizza bites? Ate them whole, after the oven. 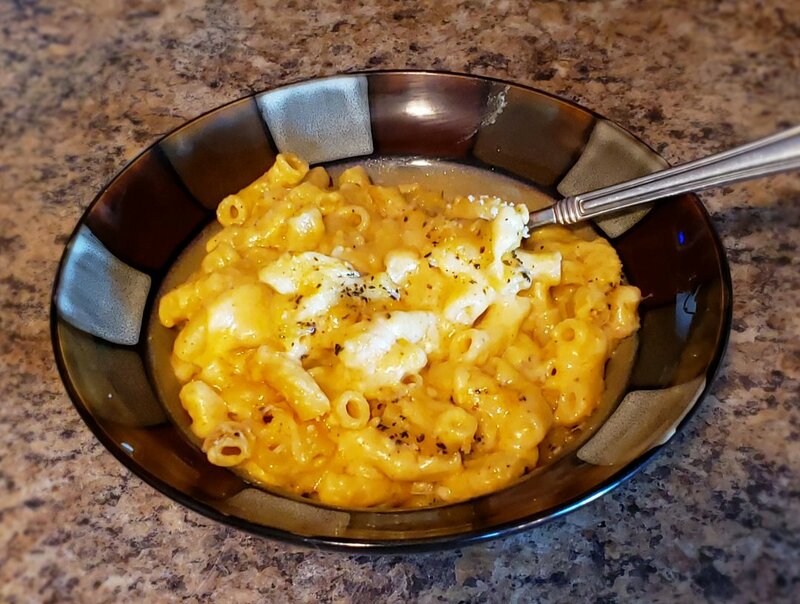 Have had many of those.tonight was a quick throw together ham,egg,cheese wrap with franks(no pic).Mac n cheese(TF special) is my go to in a rush! I’m a mess tonight, don’t judge me, lol. Where's the fish fry from? Looks great. Wow TF , I had a light breakfast, two eggs for lunch, no dinner, 4 beers . Mac n cheese, take #2. Much better outcome! 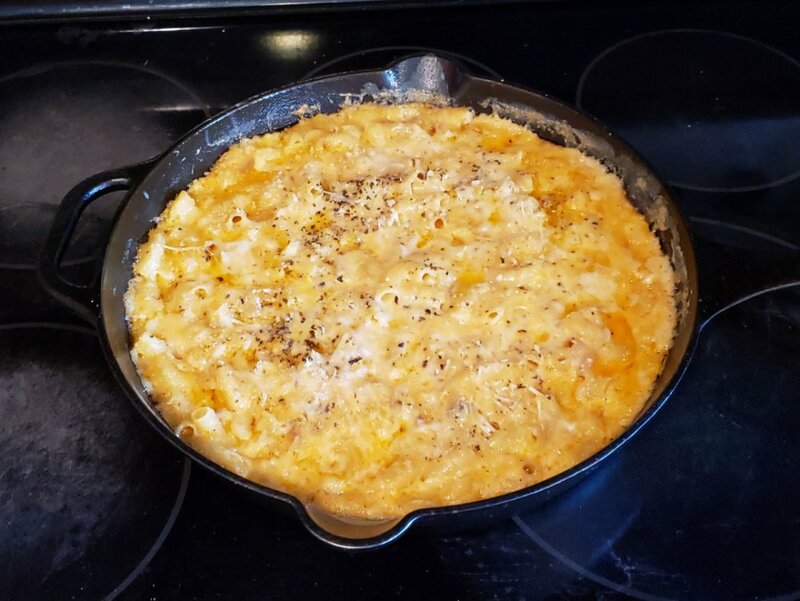 I went for a more traditional version focusing on three cheeses, adding milk and baking for just 20 minutes in the skillet. Tastes great, but I'm going to play around with this some more. Once I get the base receipe figured out, I'll make different versions using bacon, stout beer, chicken, shrimp and lobster chunks. Are you starting with a roux? If not give that a dance before adding milk and cheese...good pinch of mustard powder in the roux adds something necessary IMO as well. Thanks Biz, appreciate it. The plates were from Walmart actually. 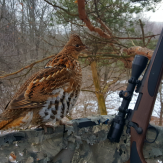 It was a 16 pc set. I have a log home, so when I renovated it, I added all kinds of square cut beams, and so on, and so forth, and made the home rustic. I thought these plates were perfect for the house, earth tone, square, and they remind me of a stream bed where you place the food. He does like a 40 minute stand up routine before the ventriloquism part. Also very funny! Was a good time. Went to Texas roadhouse before for dinner. We will let it go.... this time....lol. all the awesome meals you put together I am actually relieved that you eat like the rest of us sometimes. I have considered putting the pic of your Dad's homemade smoked sausage and taters you post as my wallpaper a couple of times. . Yum! 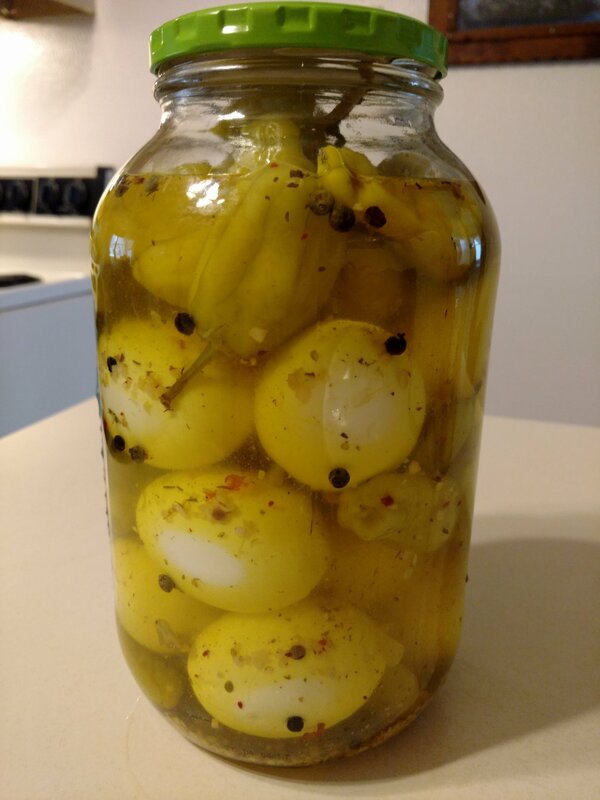 Not dinner but pickled eggs and peppercini . Made a batch should be ready to eat in a couple weeks. Oh man......do share the recipe! New Greek place in Yorktown, Pappous. Looks quite spot on Nice !